Kelly Cho, July 6, 2017, 9:27 a.m. The South Korean military and U.S. Forces Korea on Wednesday simultaneously test-fired ballistic missiles that could pulverize North Korean nuclear and missile facilities. The show of force came only a day after North Korea launched what it claimed was an intercontinental ballistic missile. South Korean forces also released footage of a "decapitation operation" drill, including practice for a strike on Kim Il-sung Square in Pyongyang. "All this shows how serious both Seoul and Washington are about Pyongyang's ICBM launch," a Defense Ministry spokesman here said. And USFK Commander Vincent Brooks said, "Self-restraint, which is a choice, is all that separates armistice and war." "As this alliance missile live-fire shows, we are able to change our choice when so ordered by our alliance national leaders. It would be a grave mistake for anyone to believe anything to the contrary," he added. The Joint Chiefs of Staff here said South Korean and U.S. forces "conducted a joint ballistic missile drill on the east coast at 7 a.m. Wednesday in response to the North's repeated provocations. The missiles hit their targets, displaying their capability of striking enemy leadership posts with pinpoint accuracy." The South Koreans launched a home-grown Hyunmu-2A missile and the Eighth U.S. Army fired an ATACMS missile. Both would be used in a war to try and kill North Korean leaders. 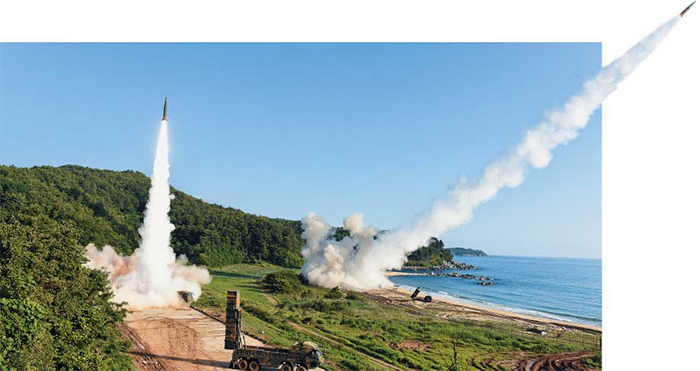 The Hyunmu-2A has a range of 300 km and a range error of only about 30 m. It carries a 500 kg warhead. The ATACMS is the USFK's is a multiple launch rocket system. There are two types, the Block I with a range of 165 km and the Block IA with a range of 300 km. Each can pulverize an area of three to four football pitches with its cluster of 300 submunitions. The USFK has deployed about 300 ATACMS missiles and the South Korean military some 200. "You can consider today's exercise as practicing a preemptive strike on North Korean missile bases," a military source here said. The footage Seoul released shows Taurus long-range air-to-surface missiles being fired from a fighter jet and turning the North Korean command posts and Kim Il-sung Square in Pyongyang to ashes. The Taurus, which the military bought from Germany last year, has a range of 500 km and a range error of a mere 1 m.
The footage also shows launches of a Hyunmu-2C missile with a range of 800 km and a SLAM-ER air-to-surface with a range of 300 km, as well as a recent flight of B-1Bs strategic bombers over the Korean Peninsula.